Deviled eggs have transitioned from the picnic table to the restaurant table as chefs add signature touches to the all-American snack. With eggs a staple in every restaurant kitchen, it’s easy to whip up a quick bar bite by cross-utilizing ingredients from an entrée or appetizer. Chef Casey adds crab, cucumber and avocado to mimic the flavors of California roll sushi. Peel and halve eggs lengthwise; transfer yolks to small bowl. Cover egg white halves and refrigerate. In mixer with paddle attachment, beat avocado well; add egg yolks to bowl and whip to a smooth consistency. Add mayonnaise, wasabi paste and salt; mix until smooth. Spoon mixture into pastry bag fitted with a plain or large star tip. Pipe mixture evenly into egg white halves. 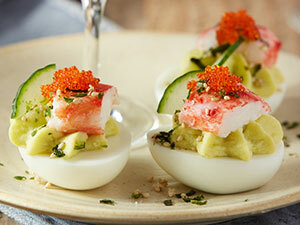 Top each egg half with a little crab meat, a cucumber slice, a sprinkle of furikake and about 1/4 teaspoon tobiko.